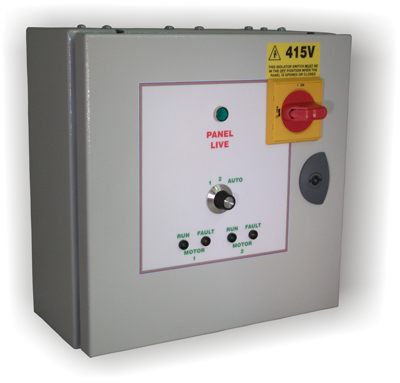 Our 3 phase Auto changeover control panels are built to suit your motors. We also build 3 phase Auto changeover controls with built in inverter or transformer speed controls. The following is an example of a bespoke 3 phase auto changeover control designed and built by Sarum to our client’s specifications. For more information about our bespoke control panels or to tell us about your specific needs, request a quote or contact us by phone or email. The panel is designed to control two, three phase fans on a duty share basis. Each fan will run for 5 hours, then change over to the standby fan. The individual fans can be selected to run continuously by selecting the required fan on the selector switch on the panel facia. If a fan goes into fault, the fault indicator lamp will illuminate and the panel will switch to the standby fan, and the volt free fault contacts will make. The control panel is designed to be wired into the buildings fire alarm circuit, this will shut the fans down in the case of a fire. Fix the enclosure to the wall using proprietary fixings. Remove the gland plate then drill and gland for necessary cable entry and exits. Replace the gland plate and wire panel in accordance with the wiring diagram. All wiring must comply with current regulations and be in compliance with the Health and Safety at Work Act. Have a question about Sarum 3 Phase Auto Changeover Controls? Please fill out the form below and we will get back to you.